Sing So Free: Children's Entertainer Raffi on Bernie, Music and Inspiration | Features | Kids VT - small people, big ideas! Since the release of his first children's album in 1976, Singable Songs for the Very Young, there hasn't been a more enduring and successful kids' entertainer on the planet than Raffi Cavoukian — better known simply as Raffi. In 1992, the Washington Post called the Egyptian-born Canadian songwriter "the most popular children's singer in the English-speaking world." That's likely still true given that he's sold more than 12 million albums in North America alone over his four-decades-long career. And that number is apt to grow as "Beluga grads" — Raffi's term for adults who were raised on his music — introduce their own kids to classics such as "Down by the Bay," "Bananaphone" and, of course, "Baby Beluga." But here's the remarkable thing about Raffi: He's achieved phenomenal success without straying from his moral compass. He's never accepted a commercial endorsement. He's never directed advertising at children. He's turned down films and TV shows. He once declined a gig at Madison Square Garden because the arena was too big. It sounds precious, but everything Raffi does is done with his littlest fans in mind. That's surely true of his music. But it's also a guiding principle in his work as an author — he's written several books for both kids and adults — and as an activist. Raffi is the founder of the British Columbia-based Centre for Child Honouring, an organization that advocates for organizing and advancing society around the needs of its youngest members. Even when he writes music aimed at adults, such as "Wave of Democracy," his recent folky, gently reggae-tinged ode to Vermont senator and presidential hopeful Bernie Sanders, he's thinking about the children. "It makes a tremendous amount of sense to have the kind of society that Bernie is talking about, where health care and education is accessible to everyone, children especially," he recently told Kids VT.
Raffi is presently touring the United States and Canada in celebration of the 40th anniversary of Singable Songs, as well as in support of his latest album, Owl Singalong — his 14th album of original children's music. That tour includes a stop at the Flynn MainStage in Burlington on Thursday, May 19. Ahead of that show, Kids VT spoke with Raffi by phone from his home in western Canada. KIDS VT: Let's start with the Bernie song. Why is a Canadian children's musician writing about a U.S. presidential hopeful? 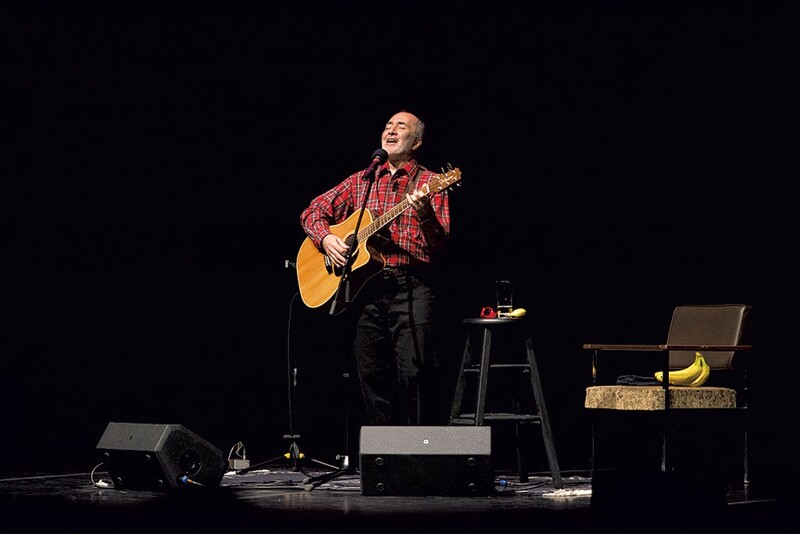 RAFFI: Ever since I had long hair back in the early 1970s, and even before then, in my teens in Toronto, I was moved by the words of Bobby Kennedy and Martin Luther King [Jr.]. And, as I evolved as a person, I kept [being] interested in what was happening in the U.S. So imagine my excitement with Bernie Sanders, who I think is the candidate of a lifetime. He's the one I've been waiting for. Somebody who will tell the truth and who is brave enough to face what Jimmy Carter calls a rigged system, an oligarchy ruled by the few, who says we need to reclaim democracy for "we the people." That message has inspired millions. And it certainly inspired me, and I wrote "Wave of Democracy." KVT: Throughout your career, you've been adamant about not accepting commercial endorsements and not targeting children in advertising. RAFFI: [With a Bernie accent] I don't have any super PAC money! KVT: Hey, that was a pretty good impression. RAFFI: Thank you, thank you. KVT: So with the rise of what you could call the "children's industrial complex," that's a lot of money to leave on the table. Have you ever been tempted to just cash in? RAFFI: I've never heard that term, but I like it. It's simply unethical to directly advertise to children who aren't old enough to understand what they're being sold. Secondly, when music is what you're known for and that's your joy and what you want to share with audiences, why do you want to suddenly sell things to that audience? It doesn't make sense, really. Except to make money, and that's not a good enough reason to do anything. I respect children as an audience and a child as a whole person. So that's been my stand in the 40 years I've been doing this work. You might say Bernie and I share one trait, which is that we can't be bought. KVT: I suspect those same principles tie into your work with the Centre for Child Honouring. RAFFI: The infant of every culture is the same physiological human being. That's a very exciting and unifying fact to celebrate, that in our earliest beginnings we are all the same creature. Whatever skin color, culture, economic status, we are all the same. So from that point of unity then, we can celebrate our differences. We don't have to fear each other. That's the universality of child honoring that I love to spread as a message, because it's how we treat the very young in our society that gives us the best chance at making peaceful and sustainable cultures. The early years are the foundational years. Our first impressions of life, how we are loved and cared for, these are what set the emotional tone of our being. And studies show that early experiences make for a lifetime of outcomes in health, productivity, resourcefulness. KVT: I don't imagine you got into music thinking you'd become a children's entertainer. How did that happen? RAFFI: I was trying to have a career much like James Taylor's career. Then something happened to me, and I came to find out how important music can be in the life of young children. I was, for a time, married, to a kindergarten teacher, a most compassionate teacher who taught me all about the child as a whole person. And that was the greatest learning in my life. So, through knowing her, I came to make an album for children. For me, discovering the joy of making music for children changed my life. Not only because the albums became so popular, but because of what it did for my heart. It opened me up to the importance of childhood in a lifetime. And it's made for a remarkable and wonderful career that I'm privileged to still enjoy. KVT: A good children's album needs to be geared toward kids but also be palatable for adults, since parents will most likely be listening to those albums on repeat. How do you strike that balance in your own work? RAFFI: I think that, right from the beginning, I made sure the music pleased my ears. So I figured if it pleased me, it would probably please other adults as well. It's the musicality. And keep in mind that children love all kinds of music, so you don't need to write in one narrow style. Over my career I've enjoyed making the finest music that I can, high quality for an important audience, keeping in mind that their parents would also be listening. KVT: Many people who grew up listening to Raffi now have kids of their own and bring them to your shows. It's sort of a brilliant model for success, because you're always going to have new fans coming along. RAFFI: That's true. Every three years I have a new audience. [Laughs.] But what's truly amazing is how my love for children keeps growing. I have a deep appreciation of their intelligence, their candor, their brilliantly playful way of being in the world. It's just really inspiring. KVT: Speaking of inspiration, where do you find it when writing children's music? RAFFI: Well, part of the inspiration for my new album, Owl Singalong, comes from my grandniece, who, when she was about a year and a half and we would talk with my sister on Skype, would hold up a stuffed owl and say "owl" over and over. The other part was the owls in my backyard, who ... [laughs], who, who are amazing. KVT: So inspiration tends to just sort of show up? RAFFI: In a way, yes. But in any genre you would tailor your music to your audience, I would imagine. So for children, you keep in mind that they're new in the world and tailor the references to what they know and also to their imagination, which is quite vast. And you keep it playful.